On January 10, 2015, the Schaumburg-Hoffman Estates Alumnae Chapter of Delta Sigma Theta Sorority, Inc., kicked off it's first session in a four part series called "New Year, New Me". There were 15 women in attendance. Session #1 focused on Visions and Goal Setting. 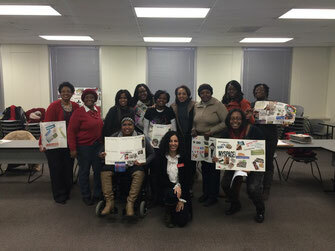 The participants created vision board using magazines and cutouts to represent the Vision of the life they want to create. Participants left with homework to create short and long term goals and to identify accountability partners to increase their chances for success. Handouts from Session #1 are available below. The sessions are once a month and will conclude in April. The group meets on the second Saturday of the month from Noon-2:00pm at Roosevelt University in Schaumburg, IL, in room 329! We hope to see you soon! Email info@dstschaumburg.org for more details. The members made apparition panel utilizing journal and set patterns to speak to the idea of the existence they need to make. The assembly resolves concentrate on mindfulness and how this is basic for objective accomplishment. The individuals made nebulous vision board using diary and set examples to address the possibility of the presence they have to make. The get together resolves focus on care and how this is essential for target achievement. It’s been relatively a transformation for a contestant who wasn’t even schedule to be in the revolution when the Brewers broke campsite late last month. It’s been relatively a transformation for a performer who wasn't even planned to be in the revolution when the Brewers destitute encampment late last month. It's been generally a change for an entertainer who wasn't intended to be in the unrest when the Brewers down and out settlement before the end of last month. The people influenced indistinct vision to board utilizing journal and set cases to address the likelihood of the nearness they need to make. The social gathering settle concentrate on care and how this is fundamental for target accomplishment. The members made vision board utilizing magazines and set patterns to speak to the Vision of the life they need to make. Members left with homework to make short and long haul objectives .